Just over 100 years ago, in November 1915, Albert Einstein presented his new formulation of space, time and gravity, writes S.Ananthanarayanan. S ANANTHANARAYANAN holds an MSc in Physics and qualifications in IT, Public Admin and Law. He is also winner of an award from the Government of India for science communication. This was soon after the two path breaking papers of 1905: the first in June, On the electrodynamics of moving bodies, and the second in September, Does the inertia of a body depend on its energy content? In these papers, Einstein set out the so-called Special Theory of Relativity, which deals with motion and energy. And in the 1915 paper, Explanation of the Perihelion Motion of Mercury from General Relativity Theory, Einstein extended the theory to include the force of gravity and applied the theory to a problem that arose in planetary motion as worked out by Newtonian mechanics. The two discoveries have since affected and dominated every possible area in science. Interest in the subject arose from the discovery that the speed of light was independent of the state of motion of its source. 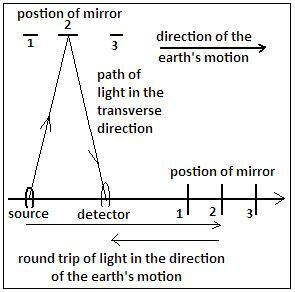 As the earth, in its orbit around the sun, moves through space at a high speed of 30 km a second, the time for light to reach a mirror and back in the direction of the earth’s orbit should be different, compared to sideways. Experiments, however, repeatedly showed this not to be the case, but that the conventional rule of addition of velocities had to be changed when speeds grew very high. Einstein thought the reason for this oddity may be that the concepts of distance and time, based on ordinary experience, ignored the time that light took to reach us whenever we made an observation or a measurement. 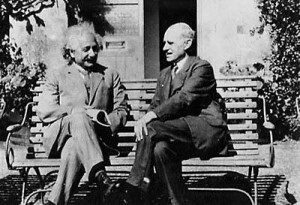 By integrating this fact into the way a distance or an interval of time was seen from reference points that were in relative motion, Einstein developed a world-view which was not in three dimensions, like the physical world which changes with time, but one where time was equally an additional dimension. And in this four-dimensional description, Einstein worked out how the measurements made from different reference points were related. The relationship, in fact, implied that moving observers found lengths to shrink and time also to move slower. The effect, of course, was miniscule and undetectable at speeds that we are used to, but became important when dealing with sub-atomic particles emitted in radiation, cosmic rays, or in collisions of such particles and so on. It is only by incorporating this kind of working that the now vast area of high energy physics can be understood and the effects have been verified in a great number of ways. Another result of the new view of nature was that the energy of motion in moving objects manifested as increase in the mass of the object, miniscule at ordinary speeds, of course. And then, that mass and energy were equivalent, and the ratio was the square of the velocity of light! This is the famous E=mc2 relation and there can be no end to relating how basically the equivalence has driven the progress of science. The view developed so far about light, radiation, lengths, time and mass was without considering the force of gravity which acts between masses. The theory developed was hence of the special case where gravity was ignored and the next development was of the general case, where gravity was also considered. In the existing world-view, interactions considered were basically electromagnetic and the rules to deal with electromagnetism had been exactly and elegantly formulated. Einstein attempted a similar description of the gravitational effect of a massive body. The relativistic rules for acceleration of objects, with the changes in measures of length and time and masses as the speed changed, which were available, were now linked with gravitation by considering the force of gravity to be the same thing as acceleration. This can be understood in terms of a weightless astronaut in a spaceship. If the spaceship were accelerated in some direction, the astronaut would not be able to distinguish between what she feels and a force of gravity. Using this kind of thinking and much abstract mathematics, Einstein created a framework in which what the presence of a mass did was to distort the shape of the four dimensional continuum of space and time. Such distortion would cause straight line movement to seem curved, along the contours of space itself. And using this method of working, Einstein was able exactly explain an anomaly in the orbit of the planet Mercury. 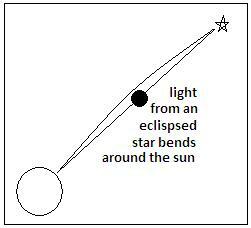 Einstein himself also proposed another way to test this assertion – that a star that was eclipsed by the sun should still be visible, because light would bend due to the sun’s gravity! This test was not immediately tried, both because Einstein’s paper was in German and translations were not readily available, and also because of World War I. But in 1919, immediately after the war, Sir Arthur Eddington and Sir Frank Dyson organised expeditions to South Africa and Brazil, to photograph the star field during a total solar eclipse that was expected in May. The pictures did show images of stars that should have been hidden behind the sun’s disc, the news was sensational, Einstein’s prediction had been proved. It was victory of a German in a field that had been dominated by Newton, an Englishman, and the verification was by English scientists, a triumph of science that eclipsed, in turn, the humdrum exchanges of post-war reconciliation. Who can comprehend the theory? PreviousWhat subjects to pick for the Leaving Cert?